We've been having more or less relentless sunshine out here -- with a few special rainy moments! -- so it hasn't really felt like soup weather. But, I love soup... and so a while back I finally just decided to give up on waiting for soup weather and forge ahead with the soup-making! Cha Cha Chili from "Soup's On"
I really love the 30-Minute Vegan series of cookbooks with recipes from Mark Reinfeld. I have all four of them and I've made great meals from each of his books. The latest book in the series is called "Soup's On," and it's all soup recipes. Yeah! I think my favorite chili in the world is probably the Brussels Sprouts and Sweet Potato Chili from Appetite for Reduction, but I still always enjoy trying out new chili recipes. 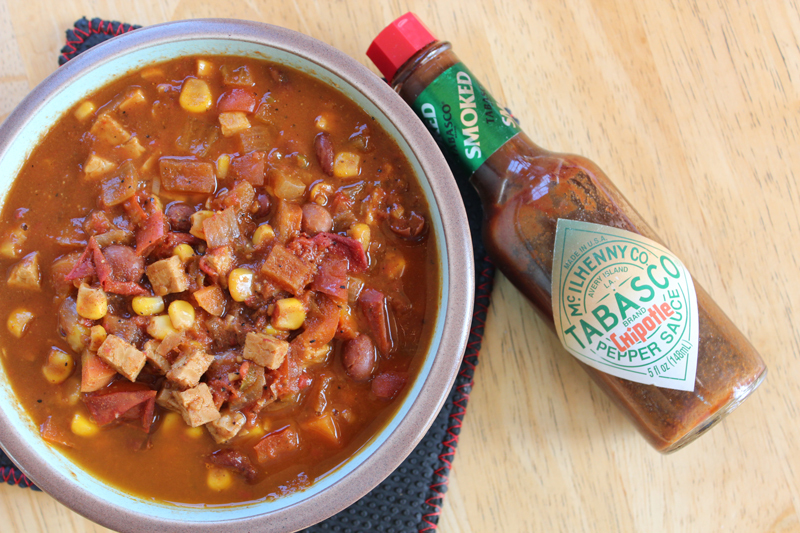 This Cha-Cha Chili was really great and is definitely a soup I would make again. I loved the tempeh bits in the chili and the spices & seasoning were strong but not overpowering the veggies. Coq au Vin from "Soup's On"
Wow, this was really special! I loved the warm, rich flavors in this chunky, substantial soup. 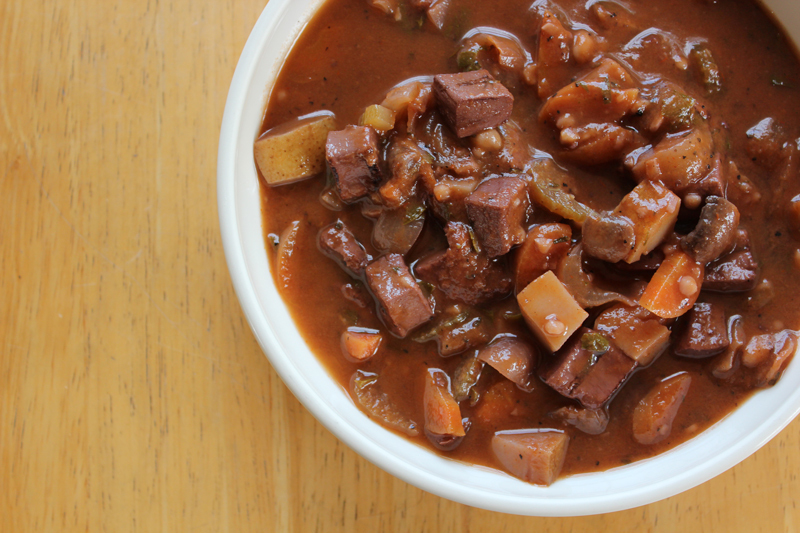 The cubed tofus are baked for extra chewiness, and are then combined with chopped veggies and a hearty red-wine soup base to make a properly filling and warming meal. For whatever reason, I don't often make meals with this rich, "meaty" flavor profile - and so this soup felt like something outside the ordinary for us. We both really loved it. One thing that I really appreciate about the recipes in this book (and the other 30-Minute Vegan books as well) is that although the recipes are fairly quick to make, they aren't simplistic. They always feature complex and truly satisfying flavors that don't taste like they came together in a hurry. 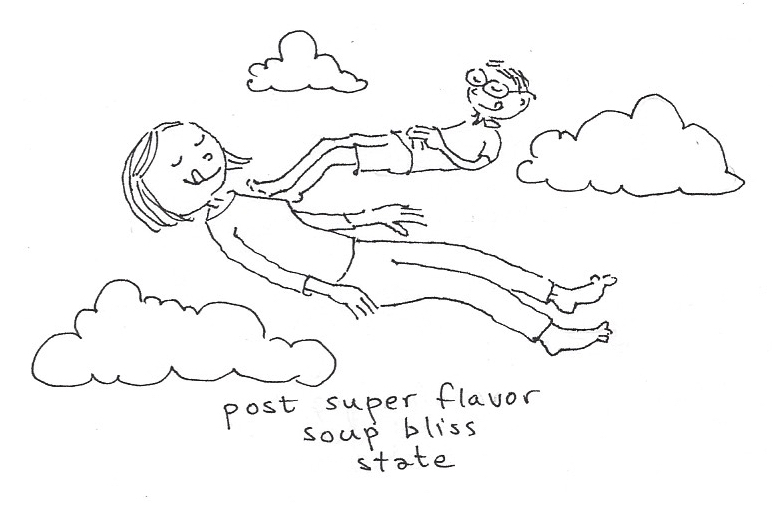 Do you want your head to explode with glorious soupy perfection overload? If so, I highly recommend this recipe. I had never heard of the In Pursuit of More blog, but judging from all my fellow vegans commenting in the comments section, I might just have been out of the loop. I had some sunchokes sitting around, so I was just searching the webs when I came upon this recipe and knew it was the one for me. Even before being turned into soup, roasted sunchokes and roasted cauliflower are two of the most delicious veggie experiences in existence. Gentle readers, this soup is SO GOOD. I am impatiently awaiting an opportunity to make it again (as soon as I can find some more sunchokes at the market!). I didn't puree it all the way, because we both prefer our soups a little more on the chunky side. As suggested, we garnished our soup with chopped hazelnuts, fresh herbs, and some vegan parmesan. Plus a side of peas, because we've been on a pea scene lately. Okay, this is not actually soup, but I'm including it anyway. Sorry, Charlie! I have all of Dreena's books, but somehow I haven't been using them much lately... so I flipped around through Let Them Eat Vegan, and decided to make this delicious quiche. 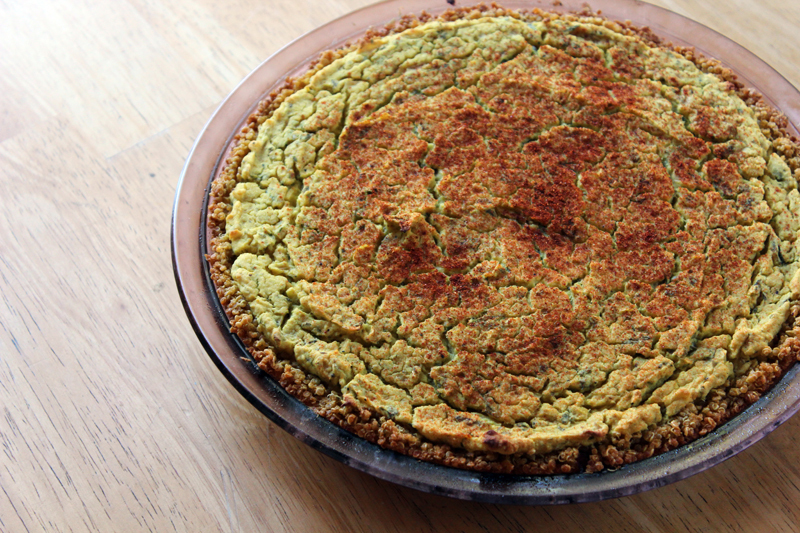 To keep things more on the low-cal side of life, I used the quinoa crust recipe from Vegan Pies & Tarts with Heart (by Dynise Balcavage), and then used Dreena's filling. Sadly, Mr VE&T isn't really a chickpea fan, so I used white beans instead. This pie was savory and delicious and full of both flavor and nutrition. I'm looking forward to finding some more Dreena recipes to try out. Any suggestions? Did you know that I make the best Minestrone Soup in the whole world? Okay, well, that's quite a claim... but I really do make a mean pot of minestrone. Here's my recipe. I like to pack it so full of veggies and flavor bombs that it's more like stew than soup. Usually I throw in a cube of my homemade tomato conserva (super-rich tomato paste), and a cube of my frozen homemade pesto. I also like to make a ginormous quantity of minestrone so that we can each have two big bowls for dinner two nights in a row. Because we are hungry minestrone piggies like that. Any special soupy suggestions? What are your favorite recipes? I had the same thought, Imogen!!! They were great! That minestrone looks AMAZING!! Like the perfect bowl of soup! why, thank you! ha ha. Yes, it really is a perfect bowl of soup! This looks so good. We have just come through a long, hot summer and we are technically meant to be in autumn right now, but the weather still thinks it is summer. Sometimes you do just have to ignore the weather and make some soup! These all look great, though particularly the cauliflower sunchoke one. I have never cooked with sunchokes (we call them jerusalem artichokes here). oh Susan - you've got to try that sunchoke soup!! have you ever roasted them? They are CRAZY good when roasted. Weird, Nick doesn't like chickpeas either! 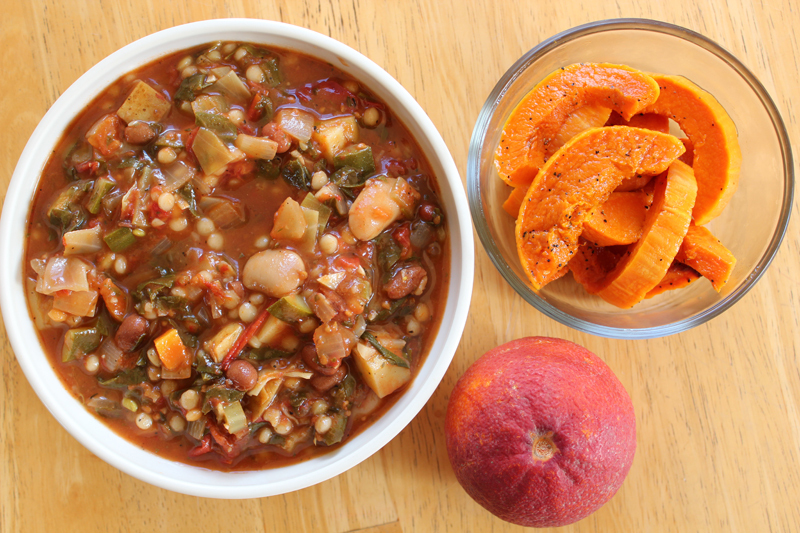 Your minestrone recipe looks so great, next time I'm in California we'll have to make it together. Your Minestrone certainly looks like the best in the world:) The Coq au Vin looks really good too. My favourite last winter was the Smoky Tomato Lentil Soup from the PPK blog - so good!! ooooh, thanks for the soup tip -- i haven't tried that smoky tomato soup yet, but my hubs is pretty much IN LOVE with tomato soup. I'm gonna put it on my list! Wow that minestrone looks soo good! especially alongside some nice roasted squash! I've been spoiled with several months of soup weather in NYC, and I am way into it! Also, freezing pesto cubes? Smart points!! yes! I forget where I learned that that frozen pesto trick, but now I do it every year and it is awesome! They're like little flavor bombs that you can just drop into anything! Oh my goodness, that last drawing is so great. Thanks for the laugh and the lovely food. ha ha! 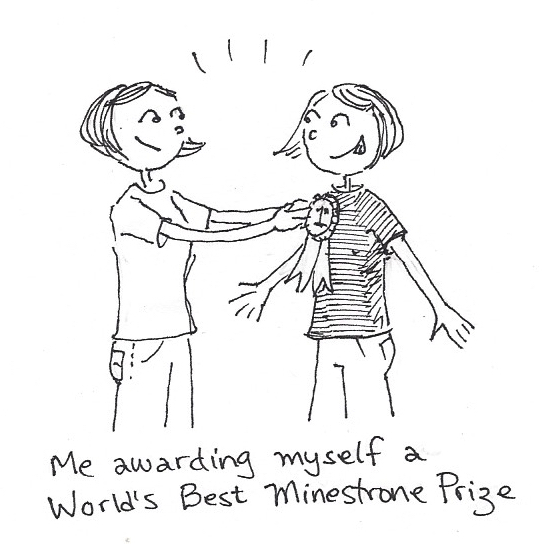 I have to say, that doodle was cracking me up even as I was drawing it. Feeling so pleased with myself! ha ha.